Among the hundreds of hacks from the fantastic website IKEA Hackers, one is particularly interesting. 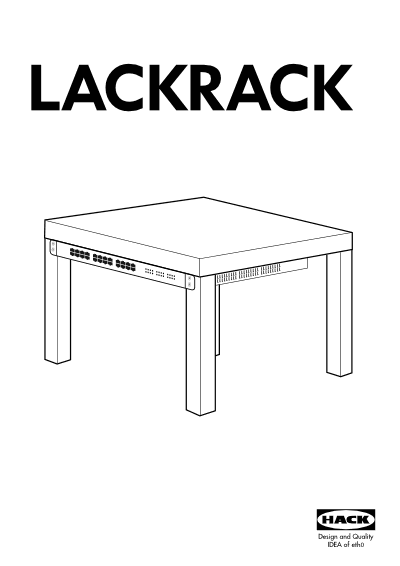 How to build a rack with an IKEA lack table worth less than 10 euros? If you are thinking on sending a new server to a remote datacenter for colocation or you have rented one or more servers in the cloud, probably you have thought that you would like to encrypt your server’s hard disk. The problem is that if you encrypt the whole hard disk (the root partition) you will need some kind of KVM to type the password remotely every time the server is restarted … sure??? No! Thanks to this nifty trick, you can enter the password remotely during the boot process. The trick involves embedding a small ssh server (dropbear) in the initramfs that allows you to enter the password remotely for the root partition at boot time. 1) Install your server with the root partition encrypted. booting system while it's running with the initramfs mounted. be installed in case of an existing cryptroot setup. As the initramfs will not be encrypted, publickey authentication is assumed. and /etc/initramfs-tools/root/.ssh/id_rsa.pub will be added to it. also honour the ip= kernel parameter. either in the '# kopt=' line or appended to specific 'kernel' line(s). Collecting enough entropy for the ssh daemon sometimes seems to be an issue. console you won't have to wait for the sshd to complete its startup. "initramfshost.example.com", and that the cryptroot passphrase is "secret"
Suppose that you want to keep the clock of one or more Xen guests synchronized with a NTP server and the Xen Host has the clock desynchronized. Also to screw things more you don’t has access to the Xen host so you can’t simply fix the clock of the Host. What can you do? In order to be able to change the clock time of your guest you need to activate the independent_wallclock bit , and then you will be able to sync it. PING google.es (173.194.37.104) 56(84) bytes of data. Warning: time of day goes back (-21us), taking countermeasures. Warning: time of day goes back (-23us), taking countermeasures. Amazing huh?? looks like the Xen project is developing in secret the time travel algorithm. The trick is that you must disable the bit independent_wallclock as soon as you has your clock synchronized and everything will work as expected. Obviously this issue will prevent you to use a NTP daemon like ntpd / openntpd. So the simplest solution is to deploy a cron job that will sync your clock with ntpdate. I have discovered a funny and didactic online game where you can test and improve your hacking skills. The objective of the game is to hack a Linux server and scale user privileges. You start with user level1 and you must exploit several bugs on the system to get access to the highest levelX that you can achieve. There are various game servers each one with different bugs that you can exploit to level up. When you get access to a level you can leave your firm on the server. Telnet to blowfish.smashthestack.org port 6666 to recieve an encrypted passwd.